A U.S. Air Force Thunderbird rests in a field where it crashed following a flyover performance at a commencement for Air Force Academy cadets, south of Colorado Springs, Colo., Thursday, June 2, 2016. The pilot ejected safely from the jet, and the plane will now be moved as the Thunderbirds again take to the air. 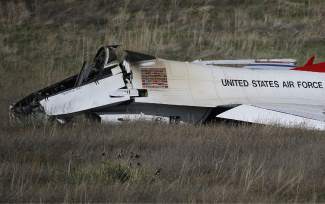 COLORADO SPRINGS, Colo. — A Thunderbirds jet that crashed in Colorado Springs after flying over the Air Force Academy’s commencement ceremony has been removed. Workers used a crane to lift the largely intact plane onto a flatbed truck on Tuesday. The $25 million aircraft will be stored at a hangar on Peterson Air Force Base where investigators will carefully go over it. The jet was removed as the Thunderbirds announced that the team would begin practicing again. However the team tweeted that it hasn’t decided yet whether to participate in the upcoming airshow in Ocean City, Maryland. The team was grounded Thursday after Maj. Alex Turner was forced to ditch his plane shortly after flying over the crowd watching President Barack Obama’s commencement address. He wasn’t seriously injured and later met the president. ASPEN, Colo. — Authorities say a 3-year-old boy pulled unconscious from Ruedi Reservoir has died. The Aspen Times reports that Pitkin County Sheriff’s Office patrol director Jeff Lumsden says the boy’s family was packing up to leave Dearhamer Campground on Sunday when a fisherman found the boy’s body in the water. Lumsden says the fisherman and two people nearby began performing CPR on the boy. He was taken to Aspen Valley Hospital and then flown to Children’s Hospital in Denver. Authorities declined to identify the boy. He died in the hospital on Monday afternoon. The family is from Parker, a town south of Denver. DURANGO, Colo. — State wildlife officials have euthanized three bears that caused extensive damage to homes and cars in a Durango neighborhood. Colorado Parks and Wildlife spokesman Joe Lewandowski says a sow and two yearlings were shot Saturday after one of them broke into a car. Residents had reported over the last few weeks that bears were breaking house windows, tearing doors off garages and breaking into vehicles. Lewandowski tells The Durango Herald that the agency had no choice but to shoot the animals because they had become habituated to humans and human food and would have continued to cause problems. The last time Colorado Parks and Wildlife officials shot and killed a bear in Durango was last summer after the animal bit two men who were camping. DENVER — Prosecutors say the driver of a pickup truck that crashed into the front doors of the Colorado Convention Center in Denver, injuring two bystanders, was drunk. The Denver District Attorney’s Office said Tuesday that 25-year-old Randolph John Blazon has been charged with two counts of driving under the influence and two counts of careless driving resulting in injury. He reportedly crossed a street, went between two light poles and struck a tree before plowing into the convention center. He couldn’t be reached for comment. Police say a man and a woman who had been inside the building were hospitalized with minor injuries after being struck by flying debris in Monday’s crash. The convention center’s trademark giant blue bear statue wasn’t damaged. DENVER — Authorities in Denver have released the names of three men who were shot to death during what investigators say was a drug deal gone wrong. The Denver coroner’s office identified the victims Monday as 28-year-old Devonne Burton, 27-year-old Sean Point and 27-year-old Derrius Woods. Burton and Point were found dead in the northeast Denver home Friday night, and Woods died at a hospital. The Denver Post reports police are looking for several men who were in a maroon SUV. No other details were released. DENVER — A woman who caused a rollover crash in Lakewood that killed a woman and left a 10-year-old boy clinging to life has been sentenced to 16 years in prison. The Denver Post reports 35-year-old Alisha Huerena was sentenced Monday for the July 23 death of 51-year-old Kimberly Henderson and the injury to Henderson’s son. Huerena pleaded guilty in April to reckless manslaughter and second-degree assault with a deadly weapon. Prosecutors say she was arguing with her husband as he drove when she grabbed the steering wheel, which caused the vehicle to slam into Henderson’s SUV. Investigators say Huerena then lied about what caused the crash. Her attorney declined to comment after Monday’s hearing. Huerena’s husband pleaded guilty in May to being an accessory to a crime. He’s scheduled to be sentenced Aug. 1.